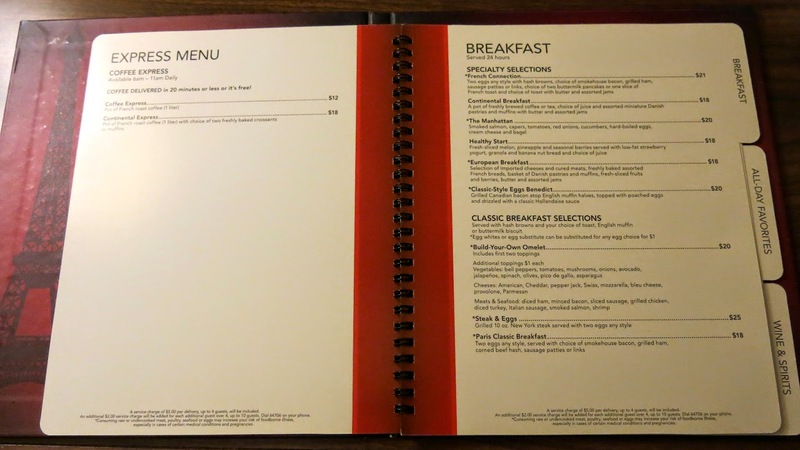 Recently stayed at the Paris Hotel in Las Vegas for a night and decided to take photographs of their latest room service menu as I noticed the prices had increased from the one they currently have online as of today April 15th, 2014. Hope it's helpful for those of you staying in the near future at this property. Click on the photos please to enlarge them. Hi Jason, I'm glad you found the menus useful. Paris is not my favorite strip hotel,however I did find the elevators to be okay the one night I stayed there. Have fun on your trip and good luck! Hi Diana, I just discovered your blog (after my trip to Vegas, of course) and I love it!! My husband took me April 4th thru 7th for my 40th birthday and we had a blast, I can't wait to go back, hopefully this summer. My next trip I will be armed with great tips and information thanks to you! Between this blog and your slot videos, I can get my Vegas fix until next time! P.S. It's so cool that you know SDGuy, I love him! He screams at the machines like I do!! Hi Jodi, so glad you found the blog and enjoy it. We were in Vegas at the same time, in fact Sdguy was there but left on April 4th so you just missed him too. I can usually locate Sdguy in any casino no matter how large due to his screaming. ;) We've known each other for a few years now, in fact I was the one that suggested he record his slot videos! Good luck on you next Vegas trip and let me know your dates when you have them, perhaps we will again be in Vegas at the same time! Cheers! Thanks for your reply!! Did you have a chance to ride the High Roller ferris wheel? We did and liked it a lot. It was a little scary (I'm terrified of heights) but the views were fabulous. There is nothing like Vegas lit up at night. I look forward to your latest trip report. Yep, the more bad luck I have the longer it takes to get the trip report out. ;) Though planting my veggie garden and a few other things going on at home have also helped delay it. Hope to see you in Vegas again soon. BTW, went through my photos and I don't see one of us, did I forget to have Ken take one? That and this trip was quite long for you. I dont think we did take a picture boo. Next time.